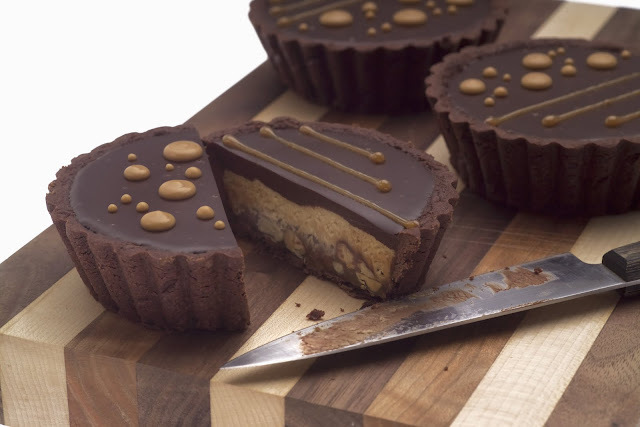 Chocolate crust, roasted peanuts, caramel, peanut butter mousse, and a generous layer of chocolate ganache. Woweee!! The gorgeous cutting board was made by my father from walnut from his farm, cherry from my uncle's farm, and maple from their original homestead. Woweee! Wow that looks delicious! Nice decoration with the caramel on top too! Hmm can't wait to make this tart. Do you have a recipe for the peanut butter mousse?